I had a good time at Banana Bungalow! It's clean, cosy and the people are very nice! 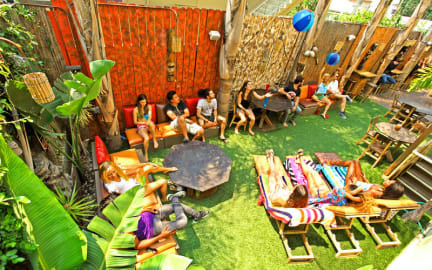 An amazing Hostel with all the options to meet new people and have fun every night. Every evening they organize something. From a bbq to beer and taco’s. Sometimes free, or for a small price. One of the best hostels we’ve stayed at during our trip!! I had a verry good time! The location is on a great spot, lots of activities on walking distance and close to the metro station. They organise lots of activities and the staff was really friendly. One thing: The cleaners take a lot of stuff. My roommate came home and they took his bed sheets so he has to make huis bed again and you will hope no one else took your place. The cleaners also took my towel, still waiting to get it back. So be carefull of your stuff. Really Nice hostel to stay in when you want to be close to Hollywood. Relaxed atmosfere. Our private room was really big with our own bathroom, kitchen and dining area. Good hostel with greath atmosphere! staff is really nice and they organize a lot of activities. Also there is plenty of things to do at night when you don’t go out. The only downside was that the bathroom is very dirty, floor was always dirty. Happy that I had slippers otherwise I would not feel comfortable. Locatie was goed, vlakbij hollywood blv. Minpunt is de vele daklozen in hollywood. Het lijkt in de avond/nacht alsof je in een horrorfilm zit. Maar dit blijkt op veel plekken in USA te zijn. Ontbijt was goed en personeel erg vriendelijk. Al met al een goeie hostel, alleen vond ik LA niet zo boeiend. Great atmosphere, great staff and great location! However, I feel you should know that there's not 1 big kitchen but several smaller ones INSIDE the rooms. Smells sometimes. And the wifi was bad.